I was clicking through the scary movies category on Netflix, and I stumbled across this film. 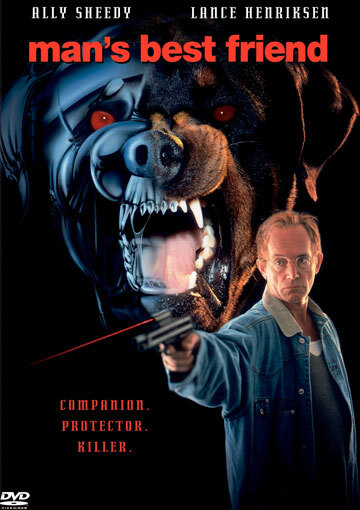 As you can see from the movie poster, it features Lance Henriksen prominently on the cover and it looks like a typical B-rated scary movie. I didn’t go into this movie watching experience expecting something amazing. I thought it would be a fun afternoon watch and a little cheesy, at the same caliber as if I’d clicked to a movie on Sci-Fi or Lifetime. First, a brief summary: An ambitious reporter, Lori (played by Ally Sheedy), sneaks into a laboratory to get a good story on animal testing. She “accidentally” ends up bringing a test-dog, Max, home with her. Max is a trained guard dog and killer, and he requires frequent monitoring and injections to keep him from leaning towards that killer side. As new “pet” owner Lori bonds with Max, he is actually devolving to a killer state. 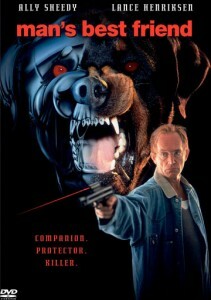 The mad scientist (Lance Henriksen) who created him, as well as bumbling policemen and animal control officers, try to capture Max throughout the film. Despite my low expectations, I was disappointed. This was a D movie that had all of the potential to become a B movie, but several things went horribly wrong. First, the movie’s genre is unclear. Is it horror? Is it sci-fi? Is it drama? Is it comedy? From the opening credits, which showed classic paintings of man and master, akin to what I’ve seen on the wall of a doctor’s office, to the strange music selection (especially the “And they call it puppy love” song), I was frequently thrown off as to how I should be feeling at any given moment. I did not jump once out of fright. The other main problem of the film wasn’t its plot, but how the plot was executed, how scenes or information were organized. For example, Max kills a mailman and buries him under the house. When cops are crawling over the house a few hours later, do they find the body? Nope, though they should, since by this point they know that Max is on an attacking spree. The body isn’t discovered until a few hours after this by a cop who is alone. It took too long for this reveal, so it was ultimately anti-climactic. The film’s only saving grace is Lance Henriksen. He plays the mad scientist role well, and I rooted for him much more than I ever rooted for stupid and naïve Lori. Sure I’m an animal rights advocate. BUT I’m not deluded enough to think that I could rescue a genetically engineered animal from a lab that I know nothing about and “save it” like Lori does. Even when her boyfriend tells her he doesn’t like the dog and that he thinks the dog is trying to kill him, she doesn’t care. Even after she knows that Max has attacked her boyfriend (maiming him and sending him to the hospital), attacked a child, and ripped out a policeman’s throat, she still only wants to protect the dog. Lance Henriksen’s Dr. Jarret is the true hero of this film, as he is the only one who understands Max’s true nature and that the only way to protect society is to keep him in a cage.